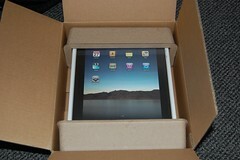 The universe smiles on me today: on the day that I finish all of my work for my undergraduate degree, my new iPad 3G appears. It's currently doing its initial sync (photo "optimization" takes ruddy forever, and I'm only synchronizing 3000 photos). For the time being, here are my unboxing photos.